One of the best things about SOLIDWORKS Inspection is the ability to completely filter and re-order the bill of characteristics to get it the way you want it. This is critical because when it comes to creating your reports you shouldn’t have to compromise or workaround software limitations. Let’s review some of the things you can do by interacting directly with the bill of characteristics. The first feature that might come in handy is the sorting command. 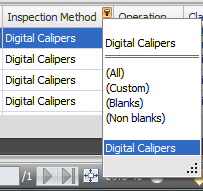 By simply clicking on any column header you can sort using this column. An arrow will appear at the top to indicate if you are sorting ascending or descending and you can always right click on the header to access all the sorting functionalities, including the “Clear Sorting” command that might be useful if you go a little crazy. Another thing I get asked a lot when talking to customers is how to organize and filter the Bill of Characteristics by Inspection Method or Operation. If you just want to quickly see all the characteristics to inspect with a specific method, you can simply mouse over the column header and click on the filter icon that appears. The filter used is clearly indicated in the bottom of Bill of Characteristics. It can be “deleted” using the “x”, it can be easily turned off by “unchecking” it or you can use the drop down list to see the previous filters used. Another useful tool is the grouping command. Right-click on any column and you have the ability to group the characteristics to inspect based on the values in this particular column. This is great to organize the characteristics based on the operation or the inspection method. Finally, the filter editor lets you build more complex filters using Boolean operators (and, or, not and, not or), fields (characteristic number, type, operation, inspection method, …), and relations (equal, greater, lower, in between, not in between, etc…). But more importantly, if you create an inspection report and the characteristics are filtered, you can either publish all the data or only the filtered data, thus making it easy to create multiple reports for different needs. Make sure to take a look back on tips 1 & 2! Stay tuned for more tips and tricks on SOLIDWORKS Inspection and as always, visit the SOLIDWORKS website or contact your nearest reseller for more information. Matt is a Product Manager for SOLIDWORKS Inspection and new initiatives. CSWE. He previously worked as a Technical Support Engineer and Product Marketing Manager for SOLIDWORKS, Simulation, Plastics and Electrical.